As requested by some of my readers, and to feed my own need to document the whole internship experience, I am bringing you the first instalment in a yet-to-be-determined-how-many-parts series. Sadly I have a feeling these posts will be text heavy and lacking in pictures. Perhaps I shall also use it to share random photos that have nothing to do with anything. Hey, it’s my blog, I can be completely indulgent if I want to! My first rotation after orientation week was in Food Service. What is Food Service you may ask? Well, basically it is the whole process of how food gets to patients from the hospital kitchen, from ordering the appropriate diet, to preparation of the food, to managing the staff in the kitchen, and everything else in between. Not gonna lie – Food Service was not a rotation I was looking forward to. Yes, I love food. But managing a hospital kitchen or other large food service system? Not exactly what I had envisioned as a potential RD career path. Knowing that I would have 10 weeks of it throughout my internship, I decided to give it the benefit of the doubt, and go into it with an open mind. And of course, I got to meet all of the great staff working in the kitchen and the diet office, learn about the countless menu options, help enter calorie count histories, check the accuracy of snacks, start the initial planning of our retail food service project (anyone have any Earth Day menu ideas? ), and I was able to start finding my way around the very confusing hospital. Not to mention – I don’t think I had any full 8 hour days in those 2 weeks at all. Can’t complain when you get to go home early! So with my first rotation in food service over, I am now onto my first clinical rotation with the Cystic Fibrosis dietitian. Come back in 3 weeks to hear more about that! 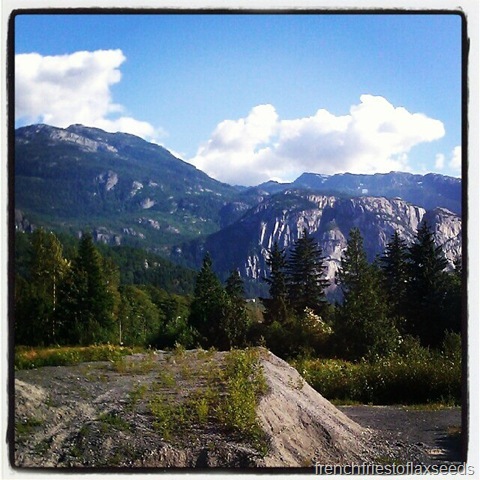 Instgram photo from my trip to Squamish this summer for the Live at Squamish Music Festival.